Farmers Domingo and Nilsa Romano are grateful for the physical and emotional support of the volunteers with the NGO El Departamento de la Comida in Puerto Rico. Puerto Rico never received the level of help it needed from the federal government after Hurricane Maria, but neighbors and volunteers pitched in to help. In my post from December, I quoted Public Radio International’s inspiring story on women farmers cooperating to make a comeback. A Living on Earth report from September 2018 shows volunteers helping out a range of small farmers. In Las Marias, up in the mountains on the western half of the island, Farmer Domingo Antonio Romano, 75, runs a small farm with his wife, Nilsa. Americans expect and deserve government help when there is a natural disaster, and often they get it. But Puerto Rico was pretty much out of sight, out of mind after Hurricane Maria. I do know someone who went there to help with logistics as part of a Federal Emergency Management team, but I also know several someones who lost everything and came to the mainland with their children. Puerto Ricans who stayed behind have been managing as best they can. I was impressed with Paige Pfleger’s story at Public Radio International (PRI) about women farmers working together to build resilience. “High in the mountains of Puerto Rico,” Pfleger writes, “a group of women struggles to keep their balance as they drive pickaxes deep into the earth of a hillside guava orchard. 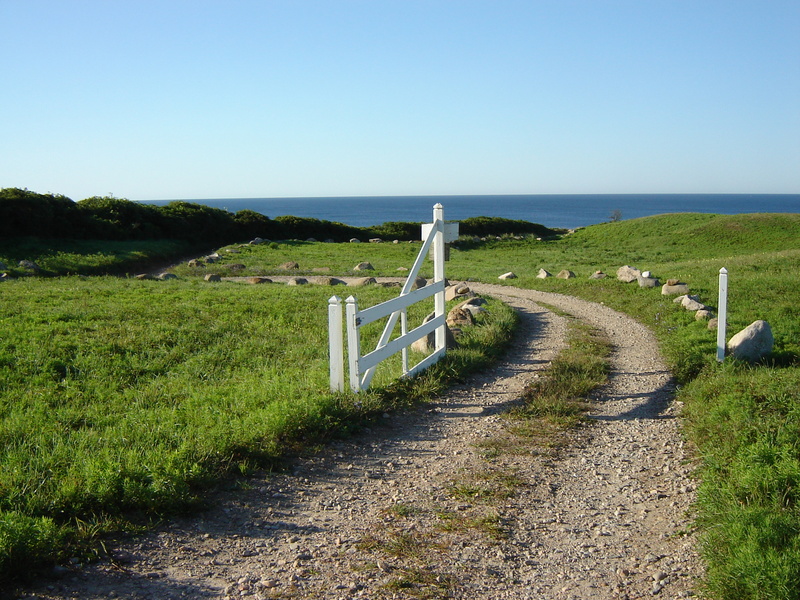 They’re digging a narrow trench called a swale on the steep terrain of this 7-acre farm. It’s a low-cost, low-impact way to retain rain water and reduce erosion in a place where both can be a challenge. “Farms in Puerto Rico were devastated during Hurricane Maria. It’s been estimated that 80 percent of the crops on the island were destroyed, and $1.8 billion of damage was done to agricultural infrastructure. “ ‘The best part from this hurricane crisis was this, that we get to organize to help each other recover,’ said Janette Gavillan, the owner of the guava orchard the Circuito is working on. “A few miles from Gavillan’s farm, Jessica Collazo works a small plot dotted with baby chicks and thin beds of fruits and vegetables. … Collazo and her husband support their family by selling their produce at local markets, but she says after Maria, they had to start from zero. “ ‘We were left with nothing,’ Collazo said. The storm washed her crops, seeds and soil over the side of the mountain. “The brigade of local farmers helped her clear fallen trees and get new seeds. Circuito members also built banks on the edges of the mountain and dug swales that Collazo hopes will reduce the damage from the next hurricane. “Collazo hopes the expertise and extra hands of the Circuito members will help her family reach its goal of building a completely self-sustaining farm. She says she wants to dig her own well so she doesn’t have to depend on the government for water, and install solar panels so she doesn’t have to rely on the local electric utility.” More at PRI, here. I can’t help thinking of the Little Red Hen (“All right, then, I’ll do it myself!”) and wondering if it’s unfair to say that this is more likely to be a woman’s experience than a man’s. In any case, it’s the women farmers arming themselves against a sea of troubles here. I hope that like the Little Red Hen, they reward themselves. I’m so glad Cousin Claire shared this New York Times story on Facebook. It’s about a school custodian with an artistic bent whose talent is raising everyone’s spirits. “For years, the 15-foot walls were faded and drab, Mr. Reyes said. “ ‘There were no colors — it was like walking into a prison,’ recalled Mr. Reyes, who said that 12 years ago he grew tired of watching students entering the building each morning with their heads down. “So he persuaded the principal to let him use leftover paint from other jobs in the building to start creating an educational wonderland. He worked for years, during his down time, his lunch hour and on his personal time, even late into the night. “Mr. Reyes, whom everyone calls Carlos, said he and his five brothers were raised by his father in the Bronx and on a farm in Puerto Rico. “ ‘We had to make our own toys from garbage, from whatever we found,’ said Mr. Reyes, who as an adult has made sculptures out of trash-picked objects, especially the wooden legs off discarded furniture, to entertain his four children and 14 grandchildren. “Until recently, said Mr. Reyes, a widower, his apartment was decorated in an over-the-top theme — a botanical garden with a pond, a lamppost and a park bench — recalling his Puerto Rican upbringing. “ ‘When my son moved back home, I had to sleep on the bench,’ he said. ‘I’d tell people, “I’m not homeless, but I sleep on a park bench.” ‘ ” More. I’ve read that no matter what kind of job you have, there should be some aspect that is yours alone, where you can express your creativity. I couldn’t agree more. 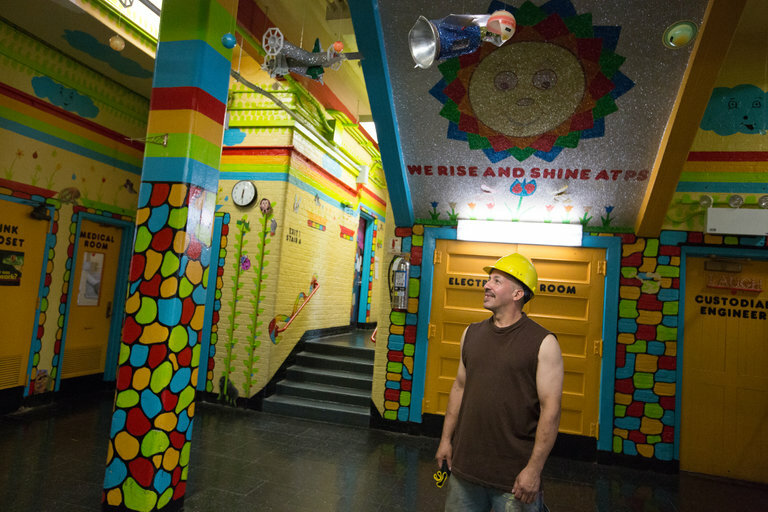 Israel Reyes, at Public School 69X in the Bronx, wanted to brighten the building for students. Cynthia-Marie Marmo O’Brien has a nice story at Narratively on a close-knit Latino subculture in the Bronx. “Generations of Nuyoricans — Puerto Rican New Yorkers — have found familia in a little house on an overgrown patch of the South Bronx,” O’Brien writes. The place is known as La Casita. She continues, “Today I am relaxing with some of the regulars under the hanging branches of trees separating us from the busy life on the street; they have picked grapes from overhead and are making wine. Read more here and see how people use music to transport themselves to Puerto Rico while still in the Bronx. Jose Rivera (left) during a jam session at the Casita. On the right, demonstrating how an out-of-tune piano can still make music. We found a letter with a return envelope in a recent issue of our newspaper. The envelope wasn’t for a tip. The newspaper delivery man was telling us, and his 629 other customers, a bit about himself and his work situation and asking how early we needed our papers. He said that the delivery service for seven national and local papers was changing. Some some clients had always wanted their paper delivered before 5:30, but he was hoping people would let him know who could wait until 6:15. He told us he makes 7-1/2 cents per household. (I think there’s a song about 7-1/2 cents from the musical Pajama Game.) He referenced the cost of gasoline and car maintenance. And then he told a story that is very common for generations of immigrants and Puerto Ricans (who are, of course, citizens but come to the mainland to provide a better life for their children). “I am father to four children who are 11. 10, 6, and 4 … My wife and I decided to move to the Untied States 4 years ago finding a better quality of life for our family. I obtained my degree as a Licensed Electirician in Puerto Rico and my wife was a Nail Technician. When we arrived in the United States, we were faced with the hard reality that neither of our licenses were valid in the US. My wife and I decided to start our studies here, so that we can obtain once again our licenses and pursue a career in our field of study. Currently, in addition to my job as a Newspaper Delivery, I go to school every night — Monday through Thursday — and I have a second job, right after I finish newspaper delivery, as an electrician assistant, while my wife is both taking care of the children, and working as a Housekeeper at St Patrick Parish. Needless to say, I wrote him and said no hurry on the paper. My husband thought the letter really embodied what the season was about.